James Bond – wearing a bespoke suit with disdain. News that Daniel Craig and his wife, Rachel Weiz, are treading the boards in New York had me wondering whether he will be wearing bespoke suits in the new production of Betrayal, directed by Mike Nichols. Mr Craig has come to epitomise the well-suited Brit over the last few years. From his Bond debut, Casino Royale in 2006, to delivering the latest Range Rover Sport in NYC, he certainly cuts a dash at every available opportunity. Of course there are those who claim that Tom Ford’s creations are not quite the thing for a British secret agent. But quite honestly I am simply relieved that he is wearing bespoke suits. One of the key reasons he consistently appears in a multitude of Best Dressed Men awards each year is that these suits are made to fit him so well. Whilst the fit for the Skyfall suits was very contemporary, in many ways the cut was really traditional – 2-button front, high lapel notch, narrow lapels that roll gently over the top button, prick-stitched working cuffs with the last button left open, and a single vent. 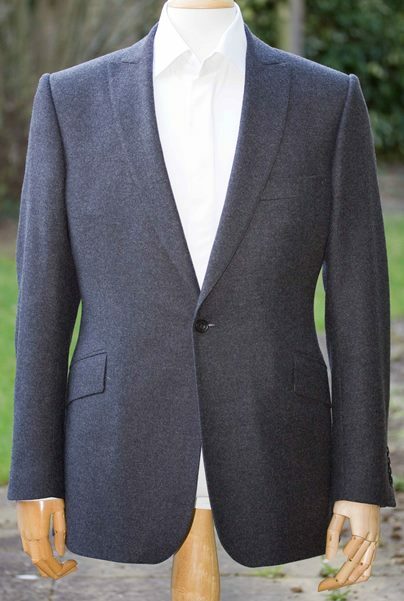 The flap pockets have only a shallow slant, hinting at the classic English bespoke style. It was also interesting to discover that the genesis for the Skyfall look came partly from Craig himself, who claims that the only thing he has in common with the fictional hero is a taste in fine suits. In conjunction with costume designer Jany Temime, the objective was for Bond’s suits to be “worn with disdain…” For those who may have missed this at the time, you can watch the full interview ­­HERE. So roll on the release of the as yet unnamed Bond 24 in October 2015 – in my book the opening of any Bond film is a flag day for Savile Row! Trying to choose the right tailored suit can be very confusing. The main reason for this confusion is that various tailors choose to label their products in so many different ways. For example one tailor may offer you a ‘made-to-measure’ service while another one offers a ‘personal tailoring’ service for the same price. Another tailor will then talk about ‘entry-level’ bespoke and we of course offer ‘semi-bespoke’. So how can potential clients possibly compare these products when they don’t really understand the differences between them? It doesn’t help that there are no industry standard definitions for these terms. A ‘made-to-measure’ service offered by one tailor could be radically more advanced than a ‘made-to-measure’ service offered by another. Unfortunately in the world of tailoring there are no regulations to govern how retailers describe their products (a source of great irritation for most Savile Row tailors). This means that any company can label their tailoring product in any way they see fit without fear of falling foul of the Trades Descriptions Act (1968). There are tailors using the word ‘bespoke’ to describe a product that is certainly not bespoke in the true sense. Often it’s a version of made-to-measure. So all I can do in this section is attempt to describe what these terms usually refer to, but in reality they could vary significantly from the label they’re given by the tailors. The only real way to tell is to talk to the tailor themselves. These are web sites that encourage you to take your own measurements and submit them via an online form. The supposed advantage of these sites is that without employing tailors to take your measurements they save on overheads so they charge very little for the suits. However, as usual in the tailoring trade you get what you pay for. I would strongly advise against trying this kind of tailoring. Having an expert to take the measurements is obviously a crucial part of the process and removing them can have disastrous consequences. The fit of a suit is only as good as the person who measures it so unless you’ve been trained to measure, expect the worst. After the suit is made there is no fitting stage, the suit is simply posted to you, so you don’t come into contact with a tailor at any point during the process. This service is most useful when a customer has seen a suit he likes in an off-the-peg store but due to his height/weight he can’t fit in to the stock sizes. The retailer will then ask their off-the-peg suppliers to make a ‘stock special’ which is almost identical to the stock size (say, 42 regular) apart from 3 or 4 small differences. Not too many companies still offer this service, I believe Aquascutum used to offer it many years ago. It’s essentially an off-the-peg with very limited alterations to the measurements. For example you might lengthen the sleeves an inch in comparison to a normal 42 regular. The fabric used is usually one that has already been used to make a range of off-the-peg suits. In the case of a stock special there are often less than five measurements taken so it’s certainly not as individual as made-to-measure. This is a very broad category as there are so many different types of made-to-measure suits offered by so many different retailers. Generally speaking you’re more likely to find this product offered in a department store than you would in Savile Row or at a local tailors. Often the measuring process is designed to be fool-proof so that untrained retail assistants can still sell the product. This means that the style and measurements will always be based on a very rigid template which means less freedom for you to express your own individual style. On average around 10-15 measurements are taken. There are a far wider range of fabrics to choose from than are available with a stock special or a self-measured suit but often all of those fabrics will be sourced from the same merchant. This product should include alterations at the first fitting (second appointment) but if you had been told that this suit was ‘bespoke’ you would be very disappointed. Again the types of this product can vary as much as the name but they all have one thing in common: They’re better quality than a made-to-measure suit but not quite as good as a fully bespoke. Generally they fit into this gap between the two products and that’s often indicated in the price. What makes them more expensive than made to measure? It can be more hand-stitching, more measurements taken or more highly skilled tailors and fitters. You will often find a wider selection of suit styles available. The internal construction should be higher quality than a basic made-to-measure suit and therefore last longer. This product tends to be offered by tailors who also offer a fully bespoke service so you’re unlikely to find it in department stores. There are several tailors on Savile Row who offer this service in one form or another. In the case of Jasper Littman semi-bespoke suits, we take far more measurements than your average made-to-measure suit. Consequently the fit is more personal to you and we can cater for a wider variety of shapes and sizes. For example, we can make suits for all sizes from a 2 year-old toddler up to a man with an fifty-four inch chest. We can also take into account what I call ‘postural idiosyncrasies’. These are individual features of your posture like dropped shoulders, a stooping stance, prominent shoulder blades, flat seat, etc. etc. All features that are part and parcel of any fully bespoke tailored suit but not often found when using made to measure services. Unlike made-to-measure systems we are also able to change the cut, occasionally designing and introducing new styles – each one more flattering than the last. If you have an unusual shape we can also offer a baste fitting, this helps us to achieve a more accurate fit with challenging physiques. When it comes to fully bespoke there is simply nothing better. No tailoring process takes more measurements than fully bespoke, no construction quality is higher and no other method of tailoring involves more specialist tailors. Bespoke in the true Savile Row sense involves around 80 hours of hand tailoring and is the worldwide benchmark for quality. – see our bespoke page for an explanation of the bespoke tailoring process. Confused? Call us on 08456 121 220 for a more detailed explanation of the various tailoring methods. We’ll try to find the right suit for your needs.